Lest you had the mistaken impression that a daygown is just for a newborn. Jeannie B. asked how big the baby was now, since she is still wearing her Sweet and Simple daygown in the picture I posted yesterday. In my reply I mentioned how her feet used to be way up inside the gown and now they peek out the bottom in her pink tights. I decided to go back and see if I had full length pictures of her wearing the gown more than once. See there are advantages of taking 47,000 pictures of one small baby! 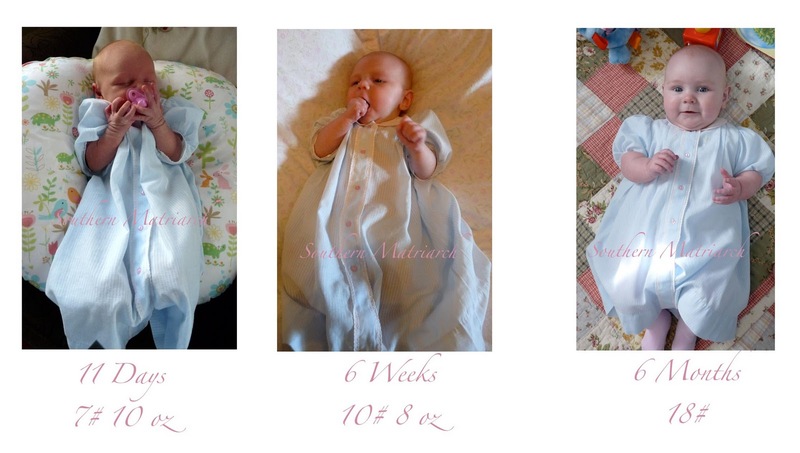 Here she is at 11 days, her lowest weight, 6 weeks and 6 months at her current weight. It still works. It makes me want to go upstairs right now and see if I can size it up a teeny bit and she can wear one for another 6 months. Love it, love it, keep her in them as long as possible!!!! So sweet at all stages -- and yea for those many photographs! Jeannie did a wonderful article in Sew Beautiful #103, N/D 2005, about enlarging infant patterns. So, so cute - both baby and gown! Boy , you made my day!!! I love seeing all three weights and months together at one time. You have no idea how many babies I have accosted over the years to check out my sizing when drafting a pattern!! What did I tell you... fits to 18 lbs! And it is so fun to see how she has changed in that time. I love seeing pictures of her! Thank you!! You don't really notice that much change until you see the side by side photos. What a cutie !! When I first saw the pics yesterday I thought you had made something new out of the blue fabric. Then I decided you had not... Love it! I do need to make several of those since they will fit to 18 lbs. She is adorable, at all ages and sizes. ORB are the best ever for fit -- and proportion. I know that the little daygowns I made for my precious DGS will fit him for a good while. If only his father will let him wear them. Oh, this makes me so happy since I have made so many daygowns for my new little one. Thanks for sharing these. And I think she is just the cutest little baby ever! What a precious little angel! She is just so perfectly beautiful, Martha. I know you are head over heels in love with her. My smocking buddy & I are pleating up some things tomorrow for me to take with me on vacation. My fingers are itching to be sewing & smocking instead of packing.